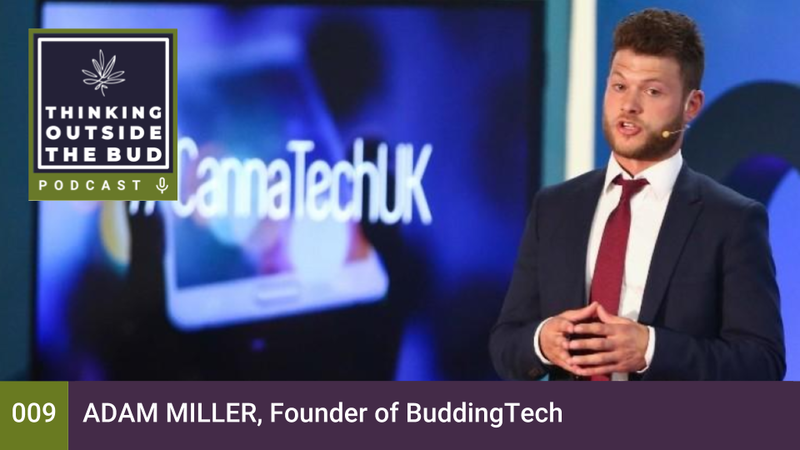 Adam Miller is the founder of BuddingTech and Board Member of the Medical Cannabis Council. Adam is also an advisor to RXMM Health which specializes in climate controlled Hydroponic Cultivation of Medical Cannabis for international markets that have regulated medical cannabis laws. [00:00:31] This is thinking outside the bud. I'm Bruce Eckfeldt. I'm your host today. We are with Adam Miller and Adam is founder of budding tech and as a board member of the medical cannabis COUNCIL OF AUSTRALIA He's also on the advisory board to the global cannabis applications Corp. which is a global leader in the development of innovative data technologies for the cannabis industry. So welcome Adam thank you for having me. [00:00:54] And I'm really excited about this one this conversation because you know I think that so I'm based in New York. We're all excited about what's happening in New Jersey and in New York State and some of the East Coast here. [00:01:06] But I actually think some of the bigger and probably more interesting aspects of the cannabis market is actually international. So know I'm really excited to kind of hear what's going on Australia. What you're doing down there how that's kind of feeding into more of the global market for cannabis and how we're really treating this as an international market rather than just kind of this you know local you know state by state country by country. I don't think so. So excited to have you on. [00:01:33] Thanks for being here. It's good to be here. [00:01:35] Why don't we start with just a little bit of background so I'm always curious about people's stories about how they got into the space what was the situation. But give our listeners a sense of how you got into how you got into the cannabis market. [00:01:48] So I had a few interesting intersection points. The first was in 2014. I so happened to meet Governor Hickenlooper in Colorado. I actually shook his hand at a at an event that he was running to raise funds for his campaign for re-election 2015. I found myself in California and I was looking around and I thought this is a very interesting space that was evolving but didn't really pay too much attention to it because the way that the system was set up it was it was so far from what I could conceive that Australia would adopt. That was just another amazing thing the Americans had figured out how to do. And then I started to read a little bit more about the medical application of cannabis. [00:02:35] The innovation that was taking place in America or in Canada or in Israel and my eyes really opened up and I will never forget I was in my parents front yard visiting from out of town and I had written an article about a startup in America called EE's applications and had an insight moment that the cannabis market would hit the Australian shores quite soon and sure enough that happened about six to eight months later the Australian Government federally legalised cannabis for medical use. So I found myself involved MySpace really by somewhat dumb luck but I'm very interested in the medical application of cannabis. I truly believe that it is quite a profound medicine and I also have a personal family member who is in need of this medication and the accessibility of it is just not here right now for people who are very dear and close to me I truly hope that in the near future cannabis in Australia will become more accessible as I see its deep importance and whereas Australia does want to say that it's federally they've passed passed legislation to make it federally legal medical use where some more insight on where the markets actually developed what is available what's not available at this point so I'll give you a bit of the background. So in February 2016 the federal government amended the drugs narcotics act and that's the legislation around narcotics drugs and the amendment was specific around the cultivation and manufacturing of cannabis for scientific and medical purposes so scientific being it can be grown for botanical research and medical use is the use that patients get from the plant as well as clinical research. So this is the first step. The second step was Hoeber 2016 when the federal government rescheduled cannabis from Schedule 9 which is the equivalent of a schedule one in America 2 0 8. [00:04:37] So moving it from a prohibited substance to a controlled substance. And over the last two years the cannabis industry has very slowly started to grow. Now although cannabis is federally legal the system is very different to how it's set up in a state in America. It's a very very pharmaceutical focused model. So products have need to demonstrate a safety and efficacy profile and there needs to be all the data that has been gathered to ensure that what the patient is getting is not only high quality consistent product but it works across different patient groups and because there are very limited products with that type of profile really 600 patients in the last two years have actually been granted federal approval to use cannabis and if you look at the German market for example in Germany the medical market established of course proximity to the Australian market in the first year about 13000 patients gained access to some sort of medical cannabis product so there's a big discrepancy there. And what was what drove the discrepancy. Well the main factor is the quality control products. Australians are very conservative people much different to them American and Canadian population strains are conservative. They go by the books and they and they pay a great deal of respect to the medical authorities and the regulators. So although cannabis is federally available it's not endorsed by the Australian Medical Association or College of Physicians. And there there's not an open support from the federal government although there is a lot of public displays of support actions speak much louder than words and 600 patients is a dismal amount in my fictional view yeah. [00:06:21] So it sounds like there's kind of these two threads going one is kind of the right regulatory scientific operational industry side and then there's kind of public perception the endorsement of a stance on cannabis as a medical tool that's now being developed. [00:06:40] So where do you and where do you think this is going and what's what's the time frame for some of these things. [00:06:45] Do you see any anything that's coming down the pipe that's going to change the situation. [00:06:51] Well it's it's hard to say. [00:06:53] I mean in the last few months the Federal Government announced and legislated export so that was announced in January and the amendments were changed a few weeks ago. So in a sparely you can now legally export cannabis products there are some minor caveats around that but technically it works. So the industry has been enabled it's the challenges the patient population in order to get a license in Australia. You need to demonstrate your supply chain. So when you're applying for cultivation or manufacturing licence you need to be able to not only explain who the the end user is but you also need to ensure that every single relationship that equals the go gets to the end user is met so cultivated need to have a relationship with a manufacturer or manufacturer needs to have a relationship with the distribution network etc. now. [00:07:47] So you're operating in a show you have to show a complete supply chain from production from road to actual putting it into the hands of a patient. Nations break prescribed protect that particular product. [00:08:00] Interesting correct and you need to be able to have those relationships in place before applying for a licence which is even tricky. So for the first year or so there was a scramble in the industry for people to form these relationships. Now it's a little easier because the industry is developed but initially it was quite challenging and it still is. But the biggest challenge is demonstrate who your patient population is although there is a body of evidence that supports the use of cannabis for various patient populations. Australians really love those clinical trials and trials so you know it's all well and good to say that we are producing a medicine for patients but you really need. You need the data to support that. So the market growth is limited as I said before 600 patients and that's really because there's not enough fully fledged clinical trial data points that are available and anecdotal data just does not do. [00:08:54] And the medical communities don't endorse the GP in Australia to prescribe cannabis and if they do that there are some rigorous approval processes both at the state and federal level so it's really there's not only jumping through hoops it's jumping through hoops with flames. [00:09:12] Was under a case of sharks with width and blood in the water so it's challenging but it again you know in the end it's the beginning of something and it will change over time I anticipate in about two years it will be much more accessible and I really think that the governments looking to introduce a local supply chain with a quality product that is consistent yield off the yield and once they've got those quality control measures in place I anticipate then the market will open up because as it stands right now the political pressure is quite significant and patients are just getting fed up. That's the truth of it yeah yeah. [00:09:50] So tell us a little bit about how your kind of playing in this space now. [00:09:54] Tell us about money Taq and some of the work that you're doing. Where are you trying to move the needle in terms of this market. [00:10:01] Thanks for asking that question. But InTech we've got a few. The initial vision of budding tech was to develop a medical cannabis accelerator so you guys have got Gateway and canopy group we are building a model for medical cannabis and hemp here in Australia. So that's that's our one that's one aspect of our business just by virtue of the fact that we've been doing this for about three years now. We also have a consultancy service arm so we help companies apply for licenses. System forming as an Australian develop strategy and implementing that strategy as well as that we help them connect into it into a network so that we find ourselves across the supply chain building relationships managing projects applying for licenses and on the opposite end really supporting a startup ecosystem two to a goal as well as that I also founded the Medical Cannabis council in 2017. It's the country's first official Cannabis Association. We're not for profit and we have just passed over the 70 member Mark. So I'm really impressed with the work that we've been able to achieve in less than a year. It's been a tremendous journey but you know there was there was a lot of fragmentation across the supply chain lot of different groups with very similar intentions norms communicating the council's core objective was to unify the voice of the industry and to create one single front so that we could communicate and then collaborate and get our message across to government consistently with very little variance in that messaging. [00:11:33] And tell us a little bit about the business landscape there from a candidates point of view look what is what companies are in place. What's been happening where they are. There are a lot of investment a lot of startups kind of Innerspace or things and it is a slow slow simmer or are we to a boil like we are. [00:11:52] It depends on where you are looking. I mean in the last two years about 20 companies have appeared in Australia mostly internationals coming into Australia doing reverse listings or not. There's a very sophisticated investor network that has an eye on cannabis here in Australia. Companies tend to gravitate towards that strategy. A large amount of startup capital is required to set up operations here in Oz. And also you've got to remember that we are very close to China so and we also have a reputation for in China or having high grade products so Australian products in China are well received. So people are adopting a long term strategy approach to the Asia Pacific market. So the kind of companies that you're seeing out of Australia are primarily cultivation or manufacturing companies Praga pharmaceuticals businesses that are developing cannabis therapies for patient populations. The startup activity is somewhat minimal you know look you're not seeing many ancillary service providers setting up in this marketplace limited tech opportunities not to say that there won't be any we are encouraging that that project to evolve. But right now given the way the industry has developed the infancy state that it's in there's less traditional tech stalled startups and more pharmaceutical style businesses being developed here and then there's the home market which is growing quite quickly. Last year there was a change to legislation that allowed for us to finally have hemp food products available here in Oz. I just did a lecture at a conference call to him Expo and it's definitely a space that's evolving quite quickly. So I anticipate the hemp industry is going to boom in the cannabis industry but shortly thereafter Yeah. [00:13:37] So in terms of the bringing in trying to bring one voice to the market water what are the things you are focused on are there any messages or intentions that you have in terms of trying to unify or trying to communicate to government and to the rest of the rest of business what's happening in that kind of space and what what kind of support and what kind of integration I need. [00:13:59] Well we're at the beck and call of our members so we have a very close dialogue with our members and the agendas set around what their objectives are. [00:14:07] So we have a number of committees across the supply chain. These committees are solely focused on determining the agenda for education or for license producers or for export. Our mandate is to build an industry backed on evidence and high quality products for patients so that mandate sits above the council to build an industry that supports these since launching of our council. But primarily what the objective is is to ensure that our members have a consensus and we put that consensus to government. So an example of this was when the government had put out a a request to industry to understand what the position on export was. We consulted with our members and put through a submission to address the government regarding the cannabis industry's interest in export and that then was successfully implemented. That's eight months later. I won't say that the cannabis council was solely responsible for that. [00:15:07] I said we played a role in shifting that position in the at a government level and you know I'm curious about the actual piece because I think that you know as much as all these local markets have growth opportunities and are doing interesting things I think the international side you know once you start looking at cannabis as an international market it's a whole ball of wax. [00:15:29] What do you see happening at an international level. How do you see Australia playing into that. [00:15:35] What do you think is going to be what can we expect over the next 12 24 months in terms of development of an international cannabis market. [00:15:43] Well the reason the federal government opened up export is to empower the local industry to have an additional revenue model that could sustain their duty to keep it viable really. Now I don't know if you know this but Australia supplies about 40 percent of the world's poppies. [00:16:03] I don't know that. [00:16:04] So we have yeah we have a reputation for producing high grade pharmaceuticals and I believe Australia intends to leverage that the supply shortages in Germany and potentially in Canada might be an off duty for Australian operators to take that their product from the local supply and move that internationally. In the last two years more than 15 countries have created a medical program in Thailand for example in Asia-Pacific region has just recently announced its intentions to legislate cannabis for medical use. So as this starts as the shift in perception charts to change around the world so too will the opportunities for product to be supplied to countries that are developing their local supply chain. [00:16:50] Just like the Australian infrastructure is developed in a similar fashion. For the first two years we have had no local product and we've been receiving most of the product from from Canada and the Netherlands. So this is how Australia will get to build up its international footprint as well as that the amount of research that's been conducted in Australia is quite quite a bit. [00:17:17] There's a number of clinical trials being developed here in Australia and eventually the intention will be to have pharmaceutical products that have gone through phase 3 clinical trials. Those products can be positioned for a global market and we have an excellent reputation for high grade pharmaceuticals as I mentioned. That's long game for Australia. And as cannabis is more widely adopted internationally so too the opportunity for those products to be shipped internationally. With that being said we do have competitors you know you look at Colombia for example where they've got quite liberal medical cannabis legislation and strong intention to export. Couple that with low cost labor and ideal growing environments you're going to have a pretty competitive product price to contempts so it's quite volatile right now where the market sits in regards to who's going to own it. So to speak. But at the same time I think that the lag is quite significant Australia has had a few years ahead of other countries. We also have a fantastic legislative system in respect to its professionalism and its structure. So I suppose the countries will model a similar medical system around the Australian infrastructure I know that you look at Israel they are going through a legislative reform right now so they're trying to kind of the industry's grown in Israel over the last 10 years or so and now they're trying to introduce legislation and regulations around the quality control and the systems in place to ensure that patients are getting a consistent product and it's distributed through a measured system. Australia already has that built in from day one. So our infrastructure although it's restrictive it will be highly effective in the next five years or so. So you know there's there's opportunities and it's hard to say what which ones are going to be the most practical but I really believe that the train has left the station and it's only a matter of time before Canibus a global scale is implemented. It's really quite exciting to see after Australia again. About 15 countries have followed suit. So it's just a cascade effect now. [00:19:16] Yeah I do think for Australia the international market is the bigger why is that where you think the big money is going to be in a couple of years. [00:19:24] I think the big money will be China supplying the. Yeah I do. [00:19:29] We have very strong trade relationship with China so I imagine that will be leveraged in due course but the local markets the most important to focus on for for us there are 20 the patient the population of Australia's about 26 million in the cane population in Australia it's between three point five to five million people and about 73 percent of the population of prescribe some sort of opiate over and over and it's about 58 percent of that is effective. [00:20:02] So there's a massive gap of patients that aren't receiving the services that actually will that several million people there are those that could benefit from a good quality medical marijuana product. [00:20:12] Yep and that's only one that's just for pain yeah. You know the other patient groups that are going to also need this medicine that are severely affected. I think the local market will be strong enough to support the companies here but it's very hard to say where the industry to go because depends if if there's a pharmaceutical approach that's adopted if there's a medical pros approach doctor or if it's a recreational approach and all of them will have very different market focuses. So Australia as I said is a much stronger focus on pharmaceutical grade cannabis. So if any country that's looking to implement a pharmaceutical model Australia will be in an ideal hub for a product. Yeah but you look over at Canada it's a systems much medical and less pharmaceutical focus and it's the accessibility as well. It's quite evident that the patient population grew last year by more than 220 7 percent. So there is a significant uptake but it's because it's not as regulated as Australia. [00:21:09] Yeah yeah it does seem like there's this whole kind of game right now between level of regulation and adoption and development of the industry. We'll see which term Krause's which curved in the next couple of years but it's it is it is. I've seen the sort of big differences and not even even here in the US on that you know state by state basis. [00:21:26] It's really affecting how the market is developing and the fact that it's federally illegal makes it even more interesting. Yes exactly. Exactly. It's all in all these little supply chains on a state by state basis. We'll see what happens if we actually get it. [00:21:39] And it's disappointing I think America is losing out on a significant opportunity. [00:21:43] I mean the amount of IP the amount of the amount of knowledge in America that exists is incredible. You know you look at some of the genetics the genetics that have been developed over in America over the last decade. It's unfortunate to see that locked away for another few years. I truly hope that the country gets its act together and some of that knowledge can be shipped internationally because it would be very well utilized especially in a country like Australia where we're trying to do rigorous research and understand really how this product works and then even looking at you know the characterisation of the entourage effect and really looking trying to understand how this plant works on a molecular level the more countries that get involved in a project like this the better it is and this is something that we're working on with the local cannabis corporation is effectively trying to characterize the entourage effect working with our licensed producers doctors and patients to really understand not only what a patient gets and how it works. Also ensuring that the doctor reports back that they are now Juul there are multiple data points that are recorded but really characterizing the chemical profile so that we can say over time off the thousands who have used this product that these therapeutic ingredients and then we can create targeted medicines which is fantastic. It's really it will be a wonderful day when we see and we truly understand how the 480 plus molecules in the cannabis plant work. [00:23:04] Yeah yeah well and it's one of the things that really makes this industry so fascinating because you have your business aspectual scientific aspects you have organisational operational delivery supply chain aspects I mean it it is multiple levels of challenges all of which are solutions to will dramatically increase its effectiveness and the growth of that of the whole industry. [00:23:25] So yeah it is certainly a challenge that we have here on the states and this whole sort of state by state regulation and the kind of the walls that we put up make make it difficult. You know also makes opportunities. [00:23:35] I've seen a lot of interesting businesses and a lot of business ideas out there that are finding ways to take advantage of that and find finding ways to leverage that. So I'd be curious to see how things play out. Adam this has been great we're just about that time. I wanted to give you a chance if people are interested in learning more about you about budding Ptak about the council's use it on about the Australian market in general what's the best way to get a hold of you and learn more. [00:24:00] Adam at budding tech Dotcom is my email address you can shoot me a line I'll respond. Now websites budding tech dot com and the medical medical cannabis council got all the resources their budding tech has a weekly mail out that we send that provides updates about the global industry. So I highly recommend tuning in to that. Fortunately we're not so big on the social media but that's changing in due course. So we will stick to the Web site and the email address is for. [00:24:29] Sounds good and I'm sure for the listeners that all of that information is in the show notes so they can click on those. [00:24:35] This has been great and we will keep in touch and hopefully we can do another episode sometime when the markets a little farther along. [00:24:44] You've been listening to thinking outside the bud with Business Coach Bruce Eckfeldt to find a full list of podcast episodes. Download the tools and worksheets and access other great content visit the website at thinkingoutsidethebud.com. And don't forget to sign up for the free newsletter at thinkingoutsidethebud.com/ newsletter.